Unu Footwear’s house slipper requires no glue, seams, buttons, or zippers—just a single sheet of die-cut recycled leather. The perfect kick-around shoe, it’s shipped completely flat, which means some assembly is required before you can slide your weary foot inside. The flat-pack design was achieved by breaking the shoe down into its basic elements, then reworking the pattern so it fit on one piece of material. Waste reduction was definitely on Unu’s mind—even the packaging tube is recycled (and recyclable). To create Unu’s slipper, designer Robert Hankey deconstructed the physical concept of the shoe into its constituent parts. (The original design, conceived in collaboration with Fauzi Fahm, was a paper-and-cardboard model.) Thanks to a series of interlocking tabs, the shoe can be wrapped around your foot in two minutes or less sans tools, adhesives, or stitching. The slipper is meant to engage you in the act of creation, thereby increasing your sense of ownership. The shoe is available in small, medium, and large sizes, as well as your choice of natural (a light tan) and black (technically a mid-gray) colors. Unu Footwear's house slipper requires no glue, seams, buttons, or zippers�just a single sheet of die-cut recycled leather. The perfect kick-around shoe, it's shipped completely flat, which means some assembly is required before you can slide your weary foot inside. 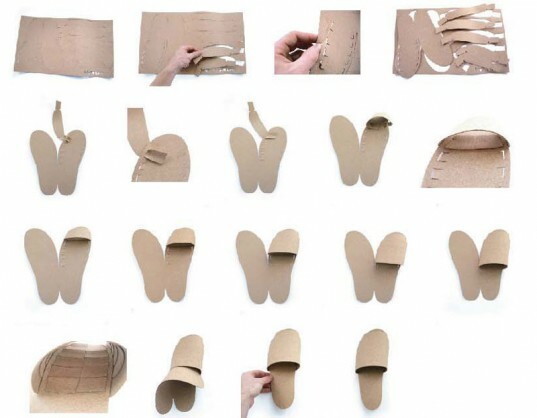 The flat-pack design was achieved by breaking the shoe down into its basic elements, then reworking the pattern so it fit on one piece of material. Waste reduction was definitely on Unu's mind�even the packaging tube is recycled (and recyclable).